Thread tails to the top. Ready to start quilting! 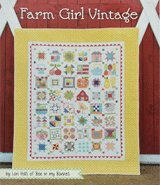 What does it mean to pull bobbin thread to the top of the quilt and why is this done? Bring the bobbin thread to the top of the quilt sandwich to keep it out of the way while you quilt. Regardless of whether you've got your walking foot installed and the feed dogs up or feed dogs down and darning foot on for free motion quilting, bring the thread up to prevent a thread's nest on the back side. It take so-o-o-o much longer to pick out stitches than to stitch them in the first place. The pictures below illustrate the steps. I've got a white cotton thread in both the needle and bobbin. 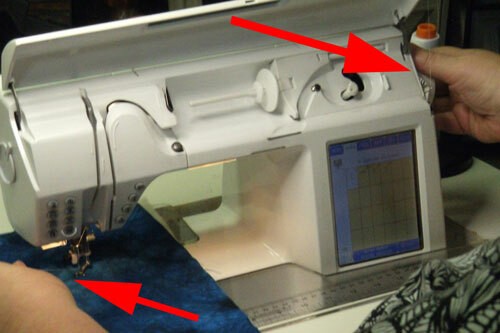 Put your quilt sandwich underneath the needle of your sewing machine. 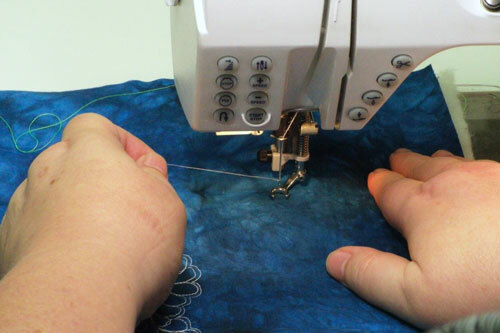 Take ahold of the end of the needle thread so that it doesn't get tangled up. Start with your needle in it's highest position and turn your hand wheel so that the needle moves to it's lowest position and back again to the highest. That is a one complete stitch. 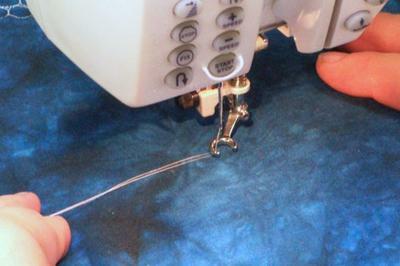 NOTE: Some machines need the presser foot down for the sewing machine to make this complete stitch. The tension disks close when the presser foot is lowered, thereby putting tension on the thread. This tension helps to create the stitch. Still holding onto the needle thread, give it a little tug. You should now see a loop of the bobbin thread around it. I have an open toe darning foot on this machine, so it's easy to get ahold of the bobbin thread and pull it to the top. If you have a foot with just a hole for the opening, carefully slide your scissor tips underneath the foot to help manuever the bobbin thread so you can grab it. In this final picture, both the bobbin and needle thread are on the top of the quilt sandwich. 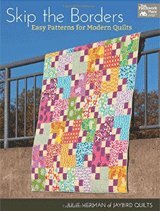 You're ready to start quilting! 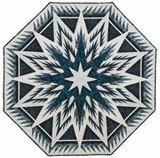 When I take my first stitches in a line of quilting, I like to hold onto the threads. This keeps a bit of tension on them which creates a better stitch, in my opinion. If you don't hold the threads, sometimes they get sucked into your machine and tangled...so much easier to avoid the problem in the first place. The ONLY time I don't pull my thread tails to the top is when I begin my quilting at the edge of the quilt sandwich. Those stitches will be caught and held by the same stitches you attach your binding with. 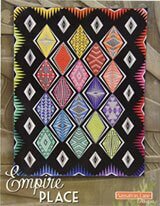 And because they are at the edge of the quilt, they are easy to grab and hold for the first bit of quilting. And just as easy to trim away...you don't need to turn the quilt over to get at them. Pam, I hope this has answered your question. 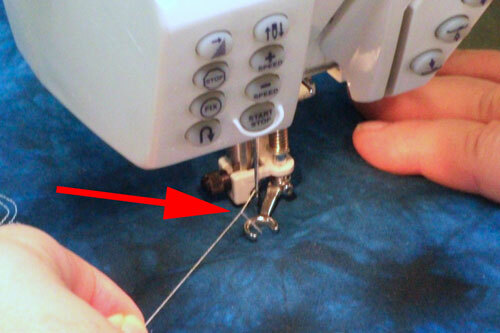 Pulling your bobbin thread to the top is a fabulous--and time saving--habit to get into when you're machine quilting. Bringing bottom thread to top for quilting. I can now start to quilt my first block of a block of the month Japanese style without getting a 'thread nest' on the backing of my quilt sandwich. Thank you so very much for explaining this answer!! 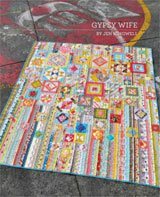 I learned to quilt through watching only YouTube videos and reading A LOT of things on this site and many others from the internet. This issue has also been plaguing me. I am so glad I finally found out how and why to put the bobbin thread on top. Thanks for this tutorial. In explaining both why and how to get the bobbin thread to the top you helped me a great deal! I am in the process of translating a quilting pattern and you definitely saved me lots of scratching my head.